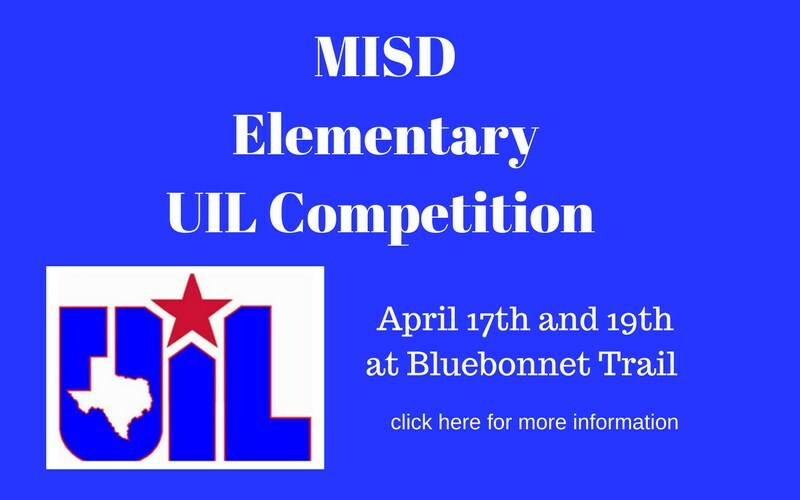 Bluebonnet Trail Elementary will host Manor ISD’s annual University Interscholastic League Competition. 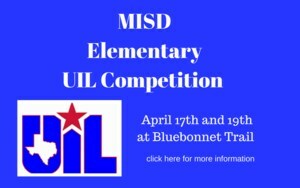 The UIL Elementary Competition is an academic competition for students in grades 2 through 5. There are several academic events students have prepared for during the school year. UIL will be held at Bluebonnet Trail Elementary on Tuesday, April 17th and Thursday, April 19th from 3:30 pm to 6:00 pm. Transportation to the competition will be provided from each school, but parents need to pick students up from the competition at Bluebonnet Trail. Please see below for the date of your child’s event. If you have any questions please contact your school’s UIL Coordinator.